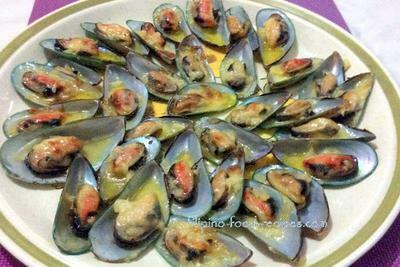 Baked Tahong or baked mussels is that seafood dish often served in buffets and special occasions. You will not find one standard recipe for this dish, you can whip up anything you please, put on the mussels, bake it and call it as such. 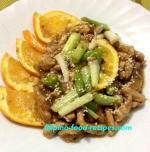 I have tried one topped with red sauce at a wedding reception in Quezon City. Though when I tried to remake it, I dropped the red sauce and went with garlic and butter, with quick melt cheese on top. Not the healthiest combination but definitely easier and better tasting than the red sauce. My youngest son who is so picky dared to try because it looks so appetizing, and he gave it a two thumbs-up. Baked Tahong is very easy to make, just saute until the shells open up, then add the butter with garlic and top it with cheese. Broil them or simply put in an oven or bread toaster until the cheese melt. 1. Saute garlic, onion and ginger, and add the mussels and cover. Cook until the shells open up. 2. Open the mussels and take out the top shell, leaving the half shell with meat. 3. Arrange in a baking pan. 4. In a separate pan, dissolve the butter and add the minced garlic. Cook for 2 minutes. 5. Using the spoon, scoop some garlic and butter and put on each mussel. 6. Top with grated cheese and bake at a 150 degree oven for 10 minutes or use a bread toaster and bake up until the cheese melt.